The Elgin Military Museum has gained some renown for bringing a Cold War blue water Oberon Class submarine (HMCS Ojibwa) into the heart of southwestern Ontario – over a thousand miles from the sea. However, the city of St. Thomas, and the surrounding county of Elgin volunteered a considerable number of men and women during both WW I and WW II to the Navy. In fact, sometimes the Navy came looking for them. Such was the case with St. Thomas born (1917) Stuart Edmund Paddon whose final year (1939) in Physics at the University of Western Ontario in nearby London, was altered to include intensive studies in electronics and highly specialized training in the new science of radar. Stuart learned he would be joining the Royal Navy thereafter for purposes that were deliberately vague. – Hmm. Paddon must have done very well because on joining the Royal Navy in 1940, he was posted as Radar Officer on the soon to be commissioned HMS Prince of Wales, a George V class battleship. His war career was not without incident and included being attacked by the Bismarck, escorting Winston Churchill to the famous meeting with Stalin, Roosevelt and Mackenzie King off Newfoundland, hitching a ride with the son of the American President and jumping into the Gulf of Siam only to find himself clinging to a biscuit box. Eventually, he and four or five others clambered aboard a catamaran which had broken loose from the ship. Despite the odds, one of those four men turned out to be a stoker from his own home town, St. Thomas Ontario. Although they had been on the same ship, the compliment was approximately 1,400 men and as an Officer charged with the special task of radar operations they had never met and had not known each other before the war. Later, Paddon served on the legendary HMS Warspite. Since Paddon was a highly skilled recruit in a new and secretive trade, his actual naval skills were limited which only added to his unique experiences. Following the events described in the articles in our Blog, Paddon served in the signals directorate at the Royal Canadian Navy Headquarters in Ottawa and was demobilized in 1945. 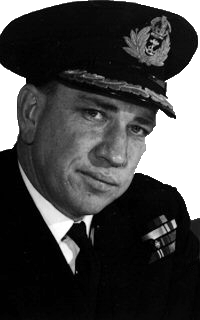 Paddon joined the regular navy as a lieutenant in June 1946. Apart from two years as electrical officer aboard HMCS Ontario, Paddon spent the balance of his career as a staff officer at shore bases, retiring at the rank of Rear-Admiral in July 1972. He passed away in November 1989 at the age of 72. Canadians in Royal Navy - Why?